Cutting the cable-TV cord has turned me into a remote-control minimalist. I can’t stand having more than one remote on the coffee table just to watch TV, especially with only one set-top box in the living room. But the main TV remote must always remain in reach because neither the Roku nor the Amazon Fire TV remotes include TV-power or volume-control buttons. For fellow minimalists, a device called Sideclick aims to be the solution. It's a small, programmable IR blaster that clips onto the remote for Roku, Fire TV, Apple TV or Google’s Nexus Player. Effectively, it combines TV- and streaming-device controls onto a single unit. After shipping to its Kickstarter backers earlier this year, Sideclick now available to the public for $30. But while it’s overall a slicker solution than juggling two separate remotes, consolidating does involve a few trade-offs. Sideclick comes with eight programmable buttons, and while they each have icons to suggest specific uses—such as power, volume, and channel—you’re free to assign these buttons to any function from any IR remote. Pressing the top and bottom buttons sets Sideclick to pairing mode, indicated by a small LED light that turns solid red. To pair a button, hold it down for a moment, point your TV remote at the Sideclick from about an inch away, and then press the button whose function you want to assign. The LED light blinks three times and then goes solid to let you know the pairing has completed. Sideclick includes eight programmable buttons, which should be more than enough for TV functions. Pairing the entire row of Sideclick buttons took less than a minute, and once paired, the buttons operate like those on a regular TV remote. The unit is powered by a pair of AAA batteries. While Sideclick is easy to set up and use, I did have one issue with performance: In my tests, Sideclick didn’t cover the same distance as the remote on my 2015 Vizio E-Series television. My couch is about 12 feet away from the television, which seemed to be just on the outer edge of Sideclick’s comfortable range. Remote functions still worked if I pointed Sideclick directly at the TV’s IR receiver, located at its bottom-left corner, or if I leaned forward by a foot or two. But overall my TV remote was much better at relaying button presses from the same couch. For a mechanism made entirely of plastic, Sideclick’s design is pretty elegant. You start by lining up a set of five plastic tabs on the remote with their corresponding slots on the cradle, then slide the cradle up to lock the two parts into place with a satisfying click. Pulling up on the cradle’s middle tab allows you to release the two parts—a move that’s only a little confusing on the first attempt. Originally, Sideclick planned to construct separate attachments for each streaming remote, none of them compatible with one another. That approach turned out to be too expensive—an initial Kickstarter campaign with a higher funding goal failed—and it would also have required an entirely new Sideclick every time you upgraded streaming boxes. In the end, Sideclick settled on selling a single IR blaster that can attach to any of the company’s streaming remote clips. The benefit to this approach, aside from being easier to manufacture, is that you don’t have to spend as much to use Sideclick with different streaming devices. Additional clips sell for $8 to $10, depending on the device. Sideclick’s base (at bottom) can clip onto any of the company’s cradles, including this one for Amazon’s Fire TV remote. There’s also no avoiding the fact that a Roku or Fire TV remote is less comfortable to hold when a Sideclick is attached. The contraption is wider than any typical remote, and users with small hands might have trouble reaching every button without changing their grip. Personally, I’d love to see a smaller version of the Sideclick with nothing but volume and power buttons, though I bet some people are pining for an expanded version as well. 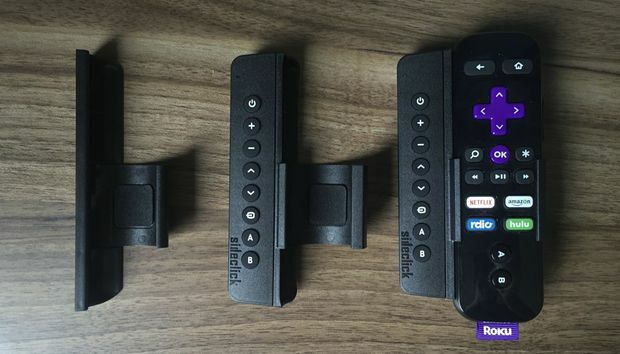 One other nitpick for Roku users: Attaching Sideclick blocks the headphone jack on Roku 3 and Roku 4 remotes. At least the Roku remote is easy enough to remove from its holster. Compared to a universal remote such as Logitech's Harmony, Sideclick is simpler and less expensive, since it doesn’t require a hub to translate different input signals. It also doesn’t make you learn a new arrangement of buttons for your streaming device, and it maintains access to device-specific features such as voice control on Roku and Fire TV. That said, some streaming devices have started to render the TV remote obsolete on their own, thanks to HDMI-CEC. Remotes for both the fourth-generation Apple TV and Nvidia’s Shield Android TV, for instance, can wake your TV from sleep and adjust volume on supported televisions. The Apple TV can also turn your TV off when you put the streamer to sleep. If those are the only devices in your living room, you might not need a separate remote with other TV functions. In fact, those two devices have become my solution for remote control minimalism in the last year, with Apple TV in the living room and the Shield in the basement. Still, other streaming device makers don’t seem interested in putting TV controls on their remotes, at least not yet. So for anyone using a Roku, Fire TV, Google Nexus Player or older an Apple TV, Sideclick is the next-best thing.